“Strong Women, Strong Hearts” included many shops. Photo by Darcy DiBiase. Life can sometimes seem like an endless series of events: Fun events, boring events. Fancy events, casual events. Events for grown-ups and events for kids. Events at work, school, church or the neighborhood. We walk away from an event with an opinion, sometimes as clear as “I liked it,” or “I didn’t like it,” and people are most likely to like an event when it gives them way more than they expected. That was something I heard a lot about on Saturday when I attended the second annual Strong Women, Strong Hearts. The event promised education, entertainment and indulgence. And the nurses who organized the event delivered on that promise. The event spread over two floors of the building, covering the Upstate Healthlink/Oasis space as well as the classrooms of Empire State College. More than 500 daughters, mothers and grandmothers wandered through the rooms, each with a theme and offering to indeed educate, entertain or delight. I expected the expert presentations. There were talks from teams of physicians, an attorney and professors. I didn’t expect them to be packed with women ranging in age from younger than me to women old enough to be my (most of them sassy and fashionable!) grandmother. Women from across our community walked out of the sessions raving about the speakers and comparing notes on what they had learned in the sessions about heart disease in women, how to prevent it and how to recognize it. In addition, a whole other room held even more experts in stroke, midwifery, diabetes, and other fields. Health screenings were offered. I got my blood pressure and my cholesterol checked, along with my BMI (body mass index) and pulmonary function or lung test. 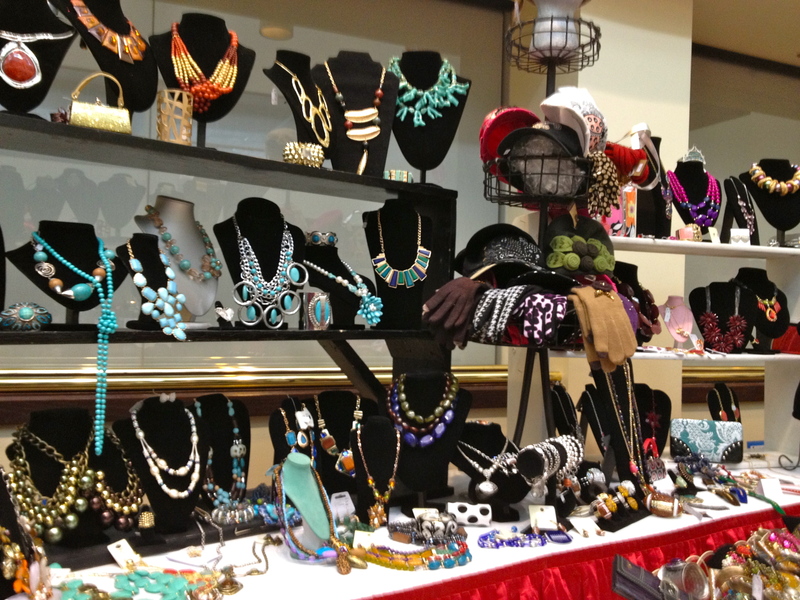 Then there was the requisite “shopportunity.” It is an event for women, right? I didn’t expect to see so many awesome little shops, nestled one after the other in a beautiful sky-lit atrium. I had to pick up some new costume jewelry, stop to smell luxuriously scented candles, and test-drive a new lipstick color. 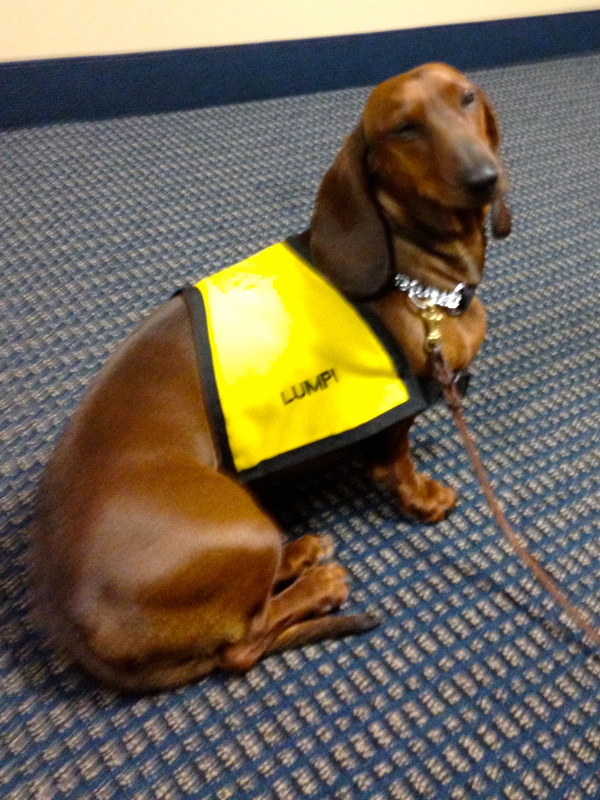 Lumpi volunteers as a therapy dog at Upstate. There were also plenty of ways to unwind. You could experience reiki therapy, yoga and meditation, get a facial or let it all go with a bit of Zumba. But some of my best stress relief came from hanging out with Lumpi and Daphne. No, these were not two of the aforementioned sassy and fashionable would-be grandmothers. They are therapy dogs at Upstate University Hospital, and they were some of my favorite smiling faces I saw at the event. This entry was posted in community, heart/cardiovascular, women's health/gynecology and tagged academic medical center, health care blog, health care social media, hospital blog, hospital social media, medical blog, strong hearts, strong women, SUNY, syracuse health care, syracuse hospital, university hospital, upstate medical, upstate university. Bookmark the permalink.